Yesterday I received another picture of me at Tandragee, so thought I'd share it with you. 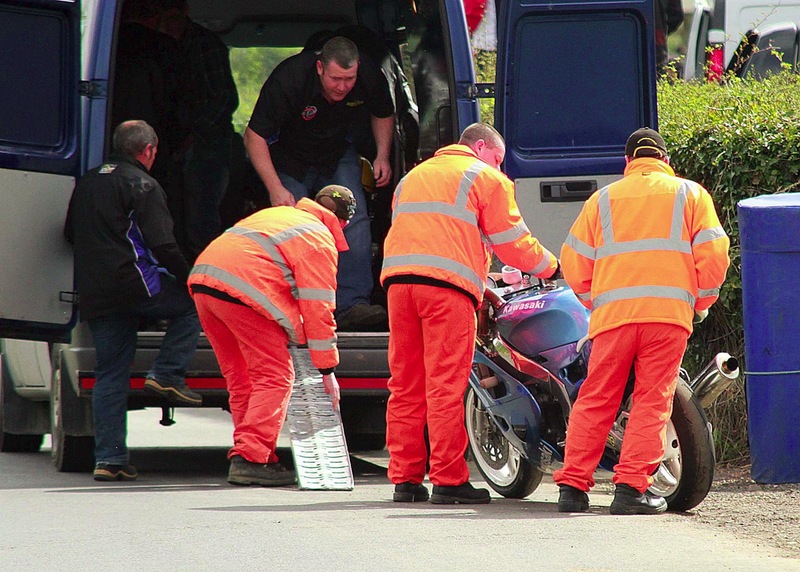 This was taken after my engine went pop and the marshals were loading her for the trip back to the paddock. Once again my thanks Jimmy for the photo. On the subject of marshals, I'd like to thank all those that give up their time to do this very important job over race weekends. I'm sure you are all aware that they all do it for the love of the job and receive no payment for it, and without them there would be no racing. Their job is sometimes very stressful, but they know how to keep cool should an incident occur, which allows the incident to be cleared and help sourced should it be needed. Places like The Manx Grand Prix always need marshals, so anytime you are visiting I'd recommend signing up. You are given training and then stationed with experienced marshals, who will show you what to do if you are called into action. Over the years I've introduced several of my mates into marshalling when at the Manx, and all have loved it and gone back for more. So go on give it a go. So thank you one and all for all the help you give all of us at some point during our racing careers.